Studying the main features that promise to define mobile commerce in 2019 and beyond. Mobile commerce has grown into one of the most exciting battlegrounds for ecommerce, partly based on the features that introduce elements of personalization, interactivity, gamification, and even cutting edge technologies such as biometrics and facial recognition to change how the game of customer interaction is played. 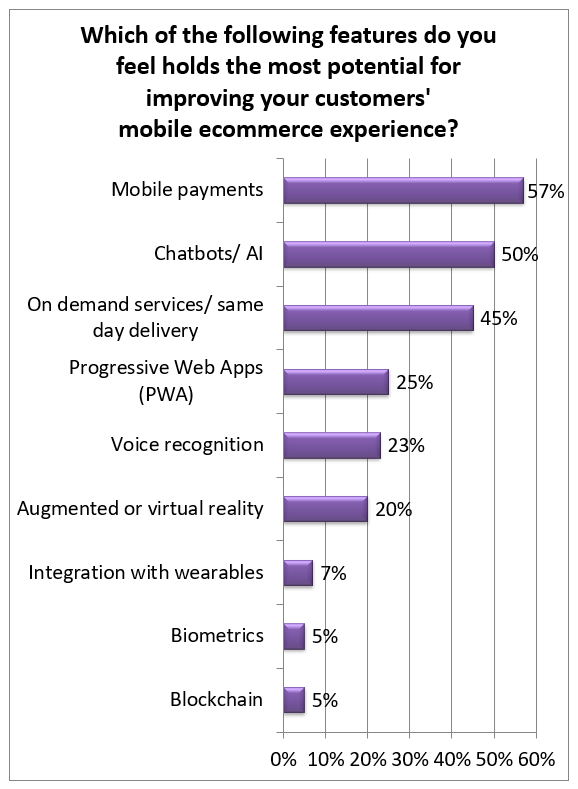 In the near future, which tools are going to define the mobile ecommerce experience? Some, like mobile payments, are already changing the landscape of how purchases are made. What's interesting is how prominent chatbots and AI have become, even more of a priority pick than same day delivery on goods and services. Rapid improvement to the development of AI means that chatbots now offer a lot of functionality for funneling customers into appropriate support channels, whether that is troubleshooting an issue, or potentially making a recommendation for a good or service they might be interested in. While the majority of respondents have not yet integrated voice recognition or augmented reality, they are being looked at by roughly one-out-of-five respondents, respectively. While developing new capabilities, it's critical to prioritize effectively around both what customers are coming to expect, especially given the latency between deciding on a course of action and implementation. On top of this, there is a litany of challenges that must be overcome on the journey from the start of a mobile ecommerce experience to one that truly stands a head above the crowd. Like many progressive ecommerce initiatives, the two most obvious challenges facing executives who are looking to develop their mobile operations are a lack of internal resources, and a lack of the appropriate budget to support the implementation of cutting edge solutions. It's notable that while a lack of executive buy-in is the third most common response, it was selected by fewer than half the number of respondents who chose the former two issues. On the road to mobile success, these three hurdles represent the most immediate barriers to progress. However, it's just as important to ensure that when an app finally is rolled out, it gains the traction and marketing push it needs to perform. 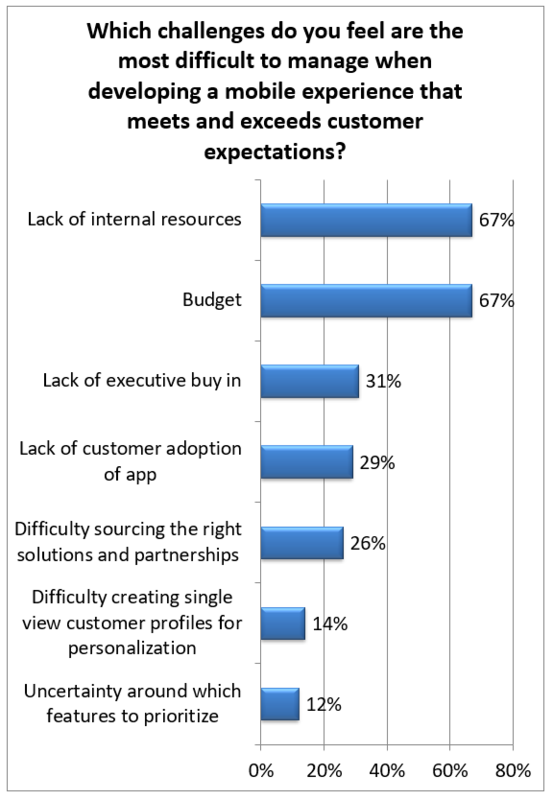 A lack of customer adoption will stymie even the best laid plans. On the same general tier as this challenge is overcoming the difficulty of sourcing the right solutions and partnerships. Finally, both difficulty creating single customer views and uncertainty around which features to prioritize are roadblocks that still have the potential to get in the way of the development of strong mobile experiences. On the one hand, without establishing synergies between mobile and overall omnichannel coordination, many progressive features for mobile apps cannot be pursued. On the other, even with a good foundation of omnichannel development, it can be difficult to know which strategies to pursue. To see the full data, stay tuned for our upcoming research report. In the meantime, you can check out our exciting research content catalog in our content center!